﻿﻿﻿The first breathing skill learnt during class is called Natural Breathing, or abdominal breathing all classes start with this intent . In fact, this is a good way to breathe all day long, unless you are involved in physical activity. In other words, you should practice breathing this way all day long, since it provides for sufficient oxygen intake and controls the exhalation of carbon dioxide. 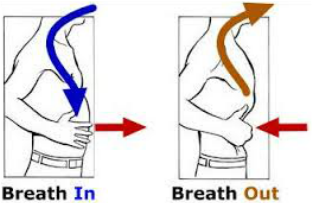 All Tai Chi movements if not instructed so follow this breathing pattern. During class we introduce different breathing patterns to stimulate the various energetic systems in the body. Gently and slowly inhale a normal amount of air through your nose, filling your lower lungs expanding your abdomen. Then exhale easily relaxing your abdomen. You might first try it with one hand on your belly and one on your chest. As you inhale gently, your lower hand should rise while your upper hand stays still. Continue this gentle breathing pattern with a relaxed attitude, concentrating on filling only the lower lungs.